This post is about unit testing an ASP.NET Core tag helper. Tag Helpers enable server-side code to participate in creating and rendering HTML elements in Razor files. Unlike HTML helpers, Tag Helpers reduce the explicit transitions between HTML and C# in Razor views. In this post I am writing unit test for a markdown tag helper, I blogged about it long back. Here is the markdown tag helper code. This will help you to add markdown html element with Text and model binding, like this. First you need to create class library using dotnet new classlib -f netcoreapp2.0 -o MarkdownTagHelper. This will create a class library project. You need to put the above code, also you need to add reference of Markdown package and Microsoft.AspNetCore.All packages. Next you need build the project and verify you’re able to build without any errors. Next you need to create XUnit unit test project and add reference of the class library project, you can do this using dotnet new xunit -o MarkdownTagHelperTests and then dotnet add project ..\MarkdownTagHelper\MarkdownTagHelper.csproj. Here is the folder structure I am following. For testing, first you need to create an instance of TagHelper, assign property and invoke the Process method. The Process method expects two objects, TagHelperContext and TagHelperOutput. So you need to create both these objects and while invoking the process method, you need to pass it. For validating the results, you can check the TagHelperOutput object’s content.GetContent property. The TagHelperContext constructor accepts three parameters. allAttributes: List of attributes associated with the current HTML tag. items: Dictionary of objects which is usually used to transfer data between tag helpers. uniqueId: Unique id for the HTML tag. Similar to TagHelperContext, TagHelperOutput class constructor also expects three parameters. getChildContentAsync: A delegate used to execute and retrieve the rendered child content asynchronously. 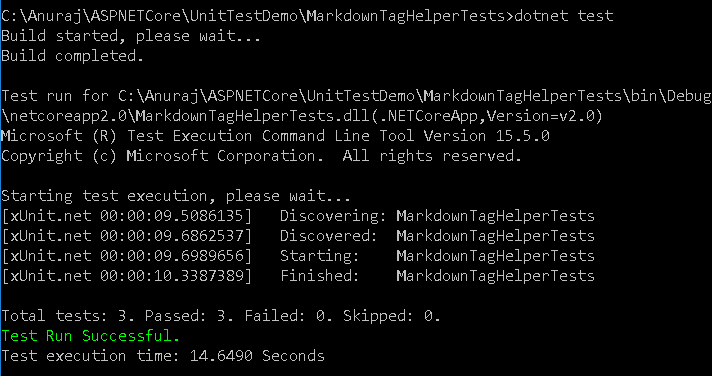 And you can run the tests using dotnet test command. 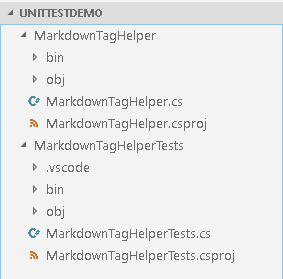 Here is the output from Markdown tag helper tests.